Looking for something new to add to your bag of tricks?! 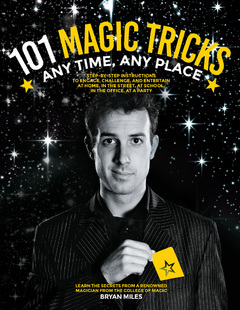 Instantly turn water into ice cubes with this incredible illusion from 101 Magic Tricks! 2.) Place some ice cubes on top of 2 the sponge. 1.) Hold the plastic cup in the left hand above the eye level of the audience. 2.) Pick up the jug of water and openly pour some water into the plastic cup. Be careful not to pour too much water in; only pour as much as the sponge can fully absorb. 3.) Place the jug back on the table and make a magical gesture over the plastic cup. Tip the cup upside down with the mouth of the cup facing away from the audience and pour the ice cubes into your open right hand. 4.) Offer the ice cubes for examination and while the volunteer examines them, secretly remove the sponge from the plastic cup and leave the cup on the table.